This is a shape poem, inspired by recent research that found the roundest object ever observed in nature to be a distant star called Kepler 11145123. 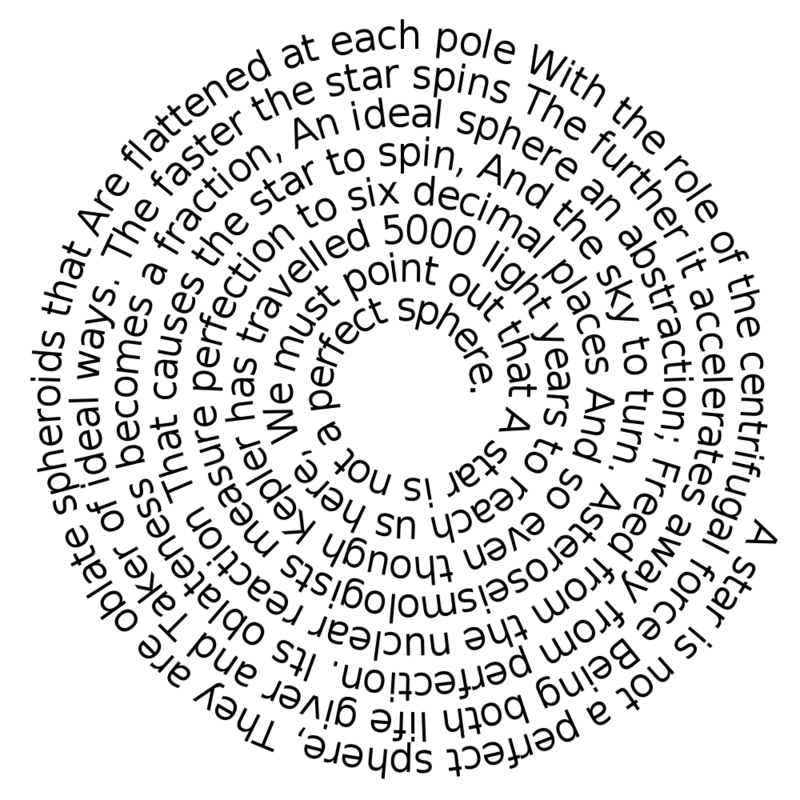 Stars are not perfect spheres, as the centrifugal force that is created as they rotate forces them to oblate (i.e. flatten at the poles). The faster the star rotates the larger this force and thus the less spherical the star. Our own star, the sun, rotates with a period of 27 days and has a radius at the equator that is 10 km larger than at the poles. However, when you consider that the sun’s radius is 695,700 km this represents only a very small flattening. The flattening of a star’s shape is found by dividing the star’s radius (R) by the difference between the radius at the equator and the radius at the poles (DR), which for the sun gives a value of DR/R = 0.00001. The researchers then looked for a star that was even more slowly rotating than the sun (the study of the oscillations of stars is called asteroseismology) and found Kepler 11145123, a star which is approximately 5000 light years away from the Earth. This star is over twice the size of the sun, with a radius of over 1.5 million km, and rotates three times more slowly, with a rotation period of 100 days. This star was thus found to have a difference in radius between the poles and the equator of only 3 km, giving it a flattening value of 0.000002 and making it is the most spherical object in nature that has ever been discovered. The shape of this poem was created using a tool provided by Festisite. Getting dizzy – think I need to print this one out to read it! This is nice information to share with us, thanks.